Year 8 students from Water Whanau enjoyed their first day in Rotorua, visiting the Te Puia geothermal valley and the Tamaki Māori Village. 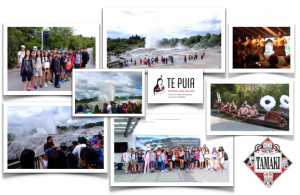 The photos below show students standing in front of the famous Pōhutu geyser that they visited following a guided tour of the Kiwi house and National Wood Carving School. Students enjoyed their first Hangi buffet experience, surrounded by wonderful cultural performances and an ancient Tawa forest.